These really are the BEST pencils. Most of the teachers around here are requesting these pencils on the school supply lists. We homeschool, and these are the only pencils I buy. Others are just a waste of time and money. These are worth the little extra, in my opinion! Amazon has Dixon Ticonderoga Wood-Cased 2HB Pencils, 96 Pencils for $9.96! Just make sure you select “96 count” from the Size drop down menu. 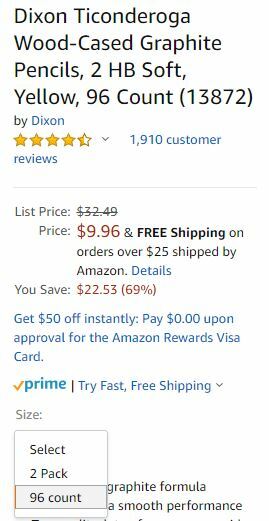 You’ll see the price show up at $9.96 with free shipping with Prime or on orders of $25 or more. This is the lowest price I’ve ever seen the 96 count of pencils at before!